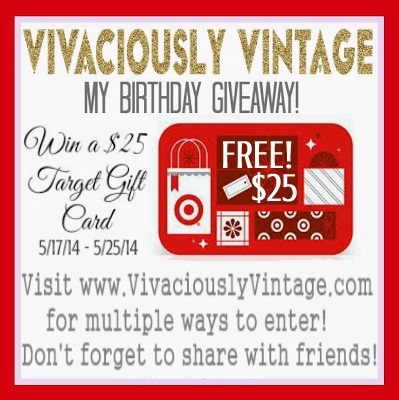 Ansley Designs: $25 Target Giftcard Giveaway! A long time ago I promised that when I got to 500 likes on Facebook that I would host my first giveaway. A thousand years later, and I've finally reached that mark! Even though it took forever a promise is a promise, and what better time to give a gift than on my birthday! I'll be turning 5 years younger tomorrow, fascinating I know! So in honor of being younger I'll share the back story of giving a present on your birthday...sort of. ;) My mom, God love her - she was very concerned with keeping things between my sister and me "fair". I think it was because we were only 3 years apart. When one of us had a birthday party, the other sister would get to invite one friend and get a present! Yes, my mother would buy a present for the other sister so we didn't feel left out! I suppose I understand it at very young ages. I mean, try explaining to a 2 year old why the other gets to have fun and open all of these presents and you get jack! However, elementary school age should be mature enough to understand that it's not their birthday! So following the tradition, I'm giving away a $25 gift card to one of my virtual sisters! Enter to win May 17 - May 25, and the winner will be announced on Monday, May 26, 2014. I figure Monday's can always use some brightening! Note: comments on this post will be disabled 5/25/14 at midnight PST. Open to US residents only. Up to TEN ways to enter!! 1 qualifying comment on this post = 1 entry! 10. Comment telling us what you would buy if you won! Winner will be chosen from the comments via a random number generator. Disclaimer: I am not affiliated with Target, and the prize is provided solely from my own funds. I will announce and contact the winner on Monday May 26, 2014. WINNER!!! #47 Sara Rowe. Congratulations! If I won I would buy sandals. If I won, I'd probably use it toward shoes! I'd get a new cardigan!! Hi! I'm on the hunt for doggie beds myself! I'd recommend not leaving an anonymous comment unless you leave your email...I won't be able to contact you if you win! I would get new shirts for summer. I'd get something for our first home-- which we are set to close on June 13th fingers crossed! If I win I would buy a kiddie pool for my little ones. wishing you a happy bloggy birthday! Following you on Google +, in my circles! I Google +1 your post and commented, and shared it with the #v2bdaygift tag! I would buy two much needed car seats for my fastly growing twins. I have to buy them new car seats! I would buy a new kettlebell or frying pan. You're in my G+ circles. I'd buy some baby formula. I follow on Facebook as Cindy Aiton. I follow on Twitter as @normawatson. Thank you so much for offering such a wonderful giveaway. I would buy a cute summer top or maybe a new pair of shorts. I follow you on Facebook and Instagram!! I would buy something for a gallery wall!! I *love* Target! Would probably buy a "summer accessory." I would buy sandals if I won. Happy blogiversary! I like V2 on facebook. #6. I follow on Pinterest as bunniker. I would buy some summer clothes if I won. I would buy some type of home decor.